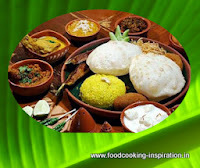 Cooking authentic Bengali foods with less oil and spices is somewhat tricky. One needs to know the right amount of heat or flame, the amount and shape of the vegetables for a particular dish, how much to cook or the perfect timing, and thus all the ingredients shall retain their tastes. 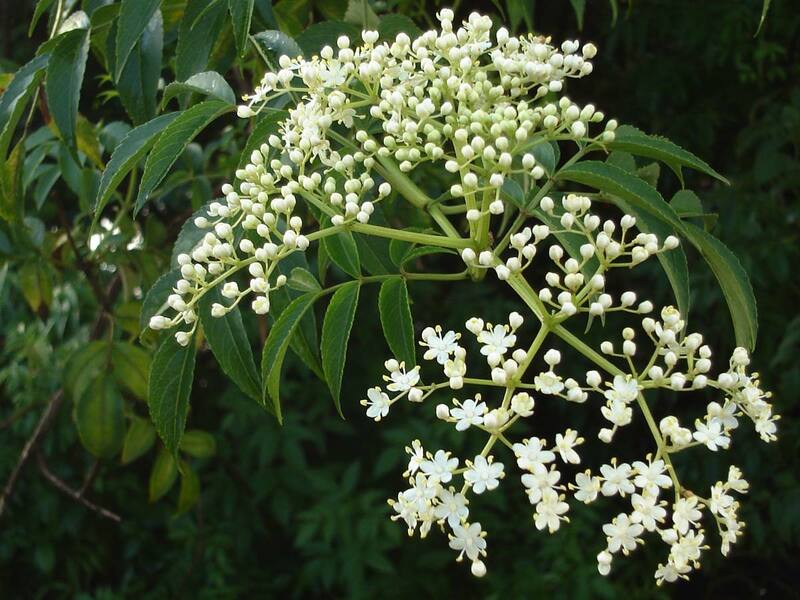 Neem (Azadirachta indica): Nimba derived from निम्बति स्यस्थ्यंददति which means "to give good health." Take some newly grown neem leaves those are slightly reddish in color, wash it well, and then pat dry. Cut the begun (vatingana) in triangular shape, (first make a round disc then cut into four per disc), wash it thoroughly and put enough salt and turmeric (holud), keep it in rest for 10 minutes. The begun (brinjal) will become soft by then. Now fry the begun (brinjal) first in oil for 5 to 7 minutes on high flame, keep aside. In that pan on low heat fry neem leaves until it will be crisp and gives out a strong aroma. It will take 8 to 10 minutes, have patience, you can forget it on stove, but do not let it burn. Turn off the flame and add the fried begun to it. If you dry much of the neem leaves you can store in a small container and keep it in the refrigerator. It can be stored for up to 2 weeks. 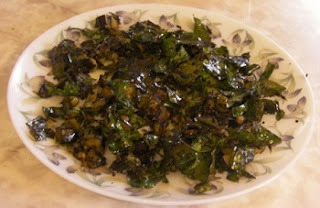 You can microwave or dry on low flame and store the dried neem leaves for cooking as well as other purposes. Do not throw away the stems of the neem leaves. Boil them till the water turns green, use it while taking a bath, a healthy and economical substitute of an antiseptic. You can always use the neem leaf dusts herbal cosmetics (face packs, bath salts etc), use it during floor cleansing, use it in your indoor plant, even you can use it as a supplement for mosquito coil or burn it with ashtagandha in dhunuchi during daily puja. hrdayabhumimjdtavedasam ayaksmdya tvd samsrjdmi Prajdbhyah"
The meaning of this sūkta is "You are Sarvatobhadra, 'Sarva' means all, and 'bhadra' means auspicious, Nimba and Arista, expanded every where, can be devoured your salubrious juices, you are capable to purify from a distance and protect from any misfortune that is why your name is Arista. You protect us from diseases and worms that tries to rob (our) health. The term Nabakalevara is derived from the Sanskrit words Naba or new and Kalevara or body, literally meaning New Body. It is an ancient ritual associated with most of the Jagannath Temples when the Idols of Lord Jagannath, Balabhadra, Subhadra and Sudarshan are replaced by a new set of Idols. A year which has two months (Adhika masa) of Ashadha as per the Hindu Calendar is auspicious for conducting the ceremony. This usually occurs every twelve to nineteen years. The Deities are made from a special type of Neem wood known as Daru Bramha. 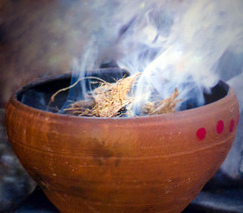 Preparations for the ceremony start in the month of Chaitra. Last ceremony was done in the year 1996. Next ceremony will be held on 2015.